Mushkil yeh hai bagh me ab tak, kate bahot purane hai.. Whenever budget comes the expectation of the people becomes very high. The main focus of people is on individual tax limit, increase or decrease in tax rates, new policy, hike or reduction in prices of commodities and other products etc. This budget was bit different. This budget contained everything what common man wanted from removing wealth tax, increase in investment in EPF, decrease in rate of customs, money for farmers, decreasing corporate tax and also implementing GST. It was a win win situation for both people and Corporates. 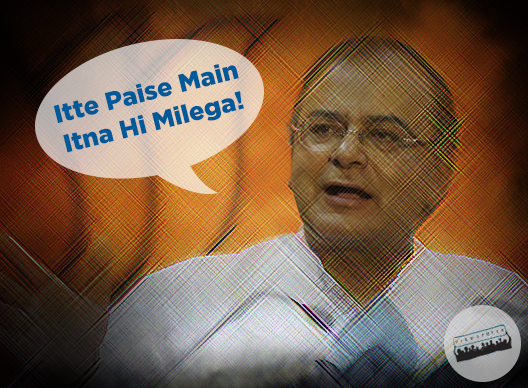 Arun Jaitley has abolished the Wealth Tax which was levied on the person whose income was 30Lakh or more. Additional 2% surcharge was introduced for the super-rich person with income of over Rs. 1 crore. For Industries rate of corporate tax which is very much useful for the newer companies as well as old one is reduced from 30 % to 25% in next four years. Total exemption of up to Rs. 4, 44,200 can be achieved. 100% exemption has been given to person who contribute to Swachch Bharat campaign launched by the MODI government apart from CSR. Service tax which was 12.5% was increased to 14 per cent where there is no Edu cess and SHEC. It will not affect much to the people but this initiative was taken because the government have to bring GST within 1yr. Excise duty was also hiked from 12.36% to 12.5% without Edu cess and SHEC. PAN number is mandatory to be provided if you purchase above Rs. 1Lakh amount. 25,000 crore has been granted for Rural Infrastructure Development Bank for farmers. 5,300 crore has been given to boost Micro Irrigation, PradhanMantri Gram Sinchai Yojna and watershed development to provide Per Drop More Crop. 5 lakh crore is the amount of credit given for the farmers. For Development of infrastructure sector Rs. 70,000 has been allocated. Tax free infrastructure binds on investment done in projects in rail, road and irrigation sectors. Revitalize infrastructure development in the Public Private Partnership (PPP) model. 150 crore has been allocated for innovation, Research & Development and scientific research sector. NITI to be established and involvement of entrepreneurs, researchers to foster scientific innovations. 5 ultra mega power projects, each of 4000MW will be established by govt.. In Jammu and Kashmir, Punjab, Tamil Nadu, Himachal Pradesh, Bihar and Assam AIIMS is to be setup. New IIT in Karnataka is to be started. Indian Institute of Mines in Dhanbad to be upgraded to IIT. PG institute of Horticulture will be setup in Armtisar. Kerala to have University of Disability Studies. An amount of Rs. 2,46,726 crore has been granted to boost Defence sector. To success the campaign of Make in India focus is given on quick manufacturing of Defence equipment. 50,000 toilets is to be constructed under Swachh Bharath Abhiyan in towns and villages. Two new programmes is to be introduced- GST & JAM Trinity. Goods and Service Tax (GST) will be implemented by April 2016. MUDRA bank will refinance micro finance organizations to encourage first generation SC/ST entrepreneurs. Housing for all by 2020. Upgradation of 80,000 secondary schools. DBT will be further be expanded from 1 crore to 10.3 crore. For the Atal Pension Yojna, government will contribute 50% of the premium limited to Rs. 1000 a year. New scheme for physical aids and assisted living devices for people aged over 80. Govt to use Rs. 9000 crore unclaimed funds in PPF/EPF for Senior Citizens Fund. 5,000 crore additional allocation for MGNREGA. to create universal social security system for all Indians. 75 crore for electric cars production. Renewable energy target for 2022: 100K MW in solar; 60K MW in wind; 10K MW in biomass and 5K MW in small hydro to support Green India. Development schemes for churches and convents in old Goa. Hampi, Elephanta caves, Forests of Rajasthan, Leh palace, Varanasi , Jallianwala Bagh, Qutb Shahi tombs at Hyderabad to be under the new tourism scheme. Visa on Arrival for 150 countries. 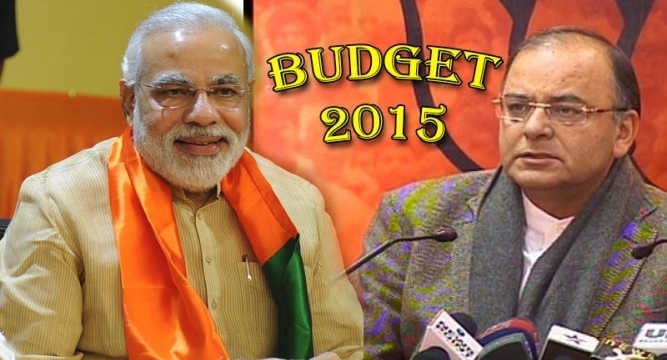 These are the highlights of the budget speech given by Finance Minister Shri. Arun Jaitley on 28th February’2015. What are your opinion on these budget and what were your expectations about the budget. Do comment below your opinion. Feel free to ask any questions.